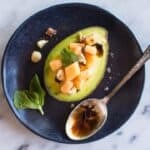 Lush avocados, sweet cantaloupe, fresh mint, crunchy hazelnuts, tangy pomegranate balsamic reduction and pinch of coffee flaked salt create a symphony of perfect flavors. These avocado boats are perfect as an appetizer, snack, or dessert! Serves 8. Pour the pomegranate juice and balsamic vinegar in a saucepan. Heat saucepan over medium-high heat. When it boils, reduce the heat to medium-low. You should still see some light bubbling in the liquid. Let it simmer for another 45 minutes, or until the liquids have been reduced to 1/3 cup. Stir occasionally to make sure that there’s no burning at the bottom of the pan. Let the reduction cool off a little before serving. Top each avocado half with diced cantaloupe. Sprinkle hazelnuts and salt on top and garnish with mint leaves. Drizzle some pomegranate balsamic reduction on each half. Serve immediately. Refrigerate leftover reduction in an airtight container for up to a week. Adapted from the September issue of Martha Stewart Living.